St Gemma's spiritual director, Venerable Father Germanus C.P. writes "Holy Communion was the culminating point of Gemma's devotion. I could quote hundreds of affections that vibrated in her virginal heart in the presence of her God, all faithfully taken from her lips and scrupulously put down in writing, but my space will not allow of it". In a letter to Venerable Father Germanus, Gemma writes "Let me speak of Holy Communion- I cannot contain myself. Is it possible that there are souls who do not understand what the Blessed Eucharist is? Who are insensible to the Divine Presence.....to the mysterious and fervent effusions of the Sacred Heart of my Jesus? O Heart of Jesus! Heart of love!" "What would become of me if I did not dedicate all my affections to the Sacred Host? Oh yes, I know it Lord; that in order to make me deserve paradise in heaven, You give me Communion here on earth!" St Gemma once called the Eucharist "a school of paradise where one learns how to love." Explaining this thought she said "The school is the Supper room, Jesus is the Master and the doctrines are His Flesh and Blood." "I am Yours, o Jesus. You have good reason to complain about me, yes, because I have offended You. And, undeserving as I am, I should be obliged to give back to the Altar so many stolen Breads, and so much precious Blood. But I promise You that I will make amends. " "My God, open Your Heart to me. O Jesus, open to me Your sacramental breast, because I wish to place all my affections there. O Jesus, how much I love Thee! But why do You act towards me me with so much love, while I offend You with countless ingratitude's? This thought alone, if I could but comprehend it, should be enough to turn me into a furnace of love. Is it not an irresistible love to love Him who is not angry with one who always offends Him? O Jesus, if I only considered attentively Your immense love for me, how greatly I should excel in every virtue! Pardon me, O Jesus, so much carelessness; pardon such great ignorance. My God! Jesus my love, infinite Goodness! What would have become of me if You had not drawn me to Thee? Open to me Thy Heart, open to me Thy sacramental breast; I open mine to You. "What do I do? If I am before Jesus crucified, I suffer; and If I am with Jesus in His Sacrament, I love." Your eyes, oh Jesus, watch continuously over me. I thirst for You, oh Jesus. Do You not see how I suffer in the morn­ing before I feed on You? Speaking of the Eucharist, St Gemma once said "It is a question of uniting two extremes. God, who is everything, and the creature who is nothing; God who is Light, and the creature who is darkness; God who is holiness, and the creature who is sin. It is a question of taking part in the Table of the Lord. There cannot be, then, enough preparation for it". Sometimes dear Father (Father Germano -ed) I tremble and turn bright red when I think of how impure I am when I recieve Jesus (in Communion -ed) who is the essence of Purity. And it is surely because of this impurity that beside the fire of Jesus I am colder and colder. But Jesus, my dear Jesus, loves me even this way, and continuously lets Himself be felt in my soul. I have only one good thing, dear Father, and it is good intentions. At least I think I have these. 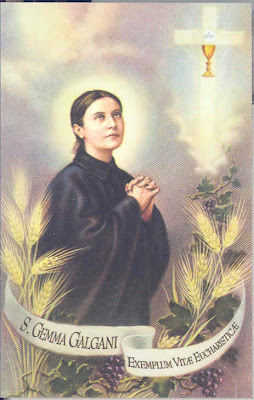 And, since Jesus tells me that this greatly helps one who is weak and poor like I am, so I hope these good intentions at least will be pleasing to one who is strong and great like Jesus"
In his book "St Gemma Galgani", Bishop Dr. Leo Proserpio S.J. writes "The Eucharist was her principal devotion; the center of her life. "'In Church' writes Signora Cecilia 'she was always by my side, and she always knelt with her eyes fixed the whole time on the tabernacle, insensible to all other things. At times people, moved by her devotion, came near to ask her for prayers. She did not seem to see or hear them. Having taken the advice of Monsignor Volpi, I undertook to reply [on her behalf] assuring them that I would pass along their requests to Gemma.' "
"What makes me feel anxious is that frequent Communion, the Bread of the Angels, has not infused into my soul all those graces that It has given to so many others in abundance. And the evil, I know it, is because my few virtues are weak, and I come to Jesus without any merit. Help, help my Father! I should by this time have reached much greater holiness, and instead I have gone backwards, to the loss of my poor soul. At times, believe me Father, I tremble and blush all over when I think that, being so vile, I go to receive Jesus, who is purity itself. But Jesus, dear Jesus, loves me even in this state and continues to make Himself felt in my soul. "Today I have recieved Jesus, and now I posess Him entirely in my miserable soul. In such moments my heart and the Heart of Jesus are one. Oh, if only I could make it remain so always! It would mean that I would not commit anymore sins. Oh, what precious moments are those at Holy Communion! Communion is a happiness, Father, that seems to me cannot be equalled even by the beatitude of the Saints and Angels. They admire the face of Jesus, and are certain of not comitting sin or of being lost; and I admire those two things, and I should like to be of their company, but I too have reason for exaulting, for Jesus enters everyday into my heart. Jesus gives me all of Himself, though I give Him nothing worthy in return. I always ask Him for so many things, and to tell the truth, I am afraid of wearying Him, but He says no and not to worry. Blessed be Jesus!" 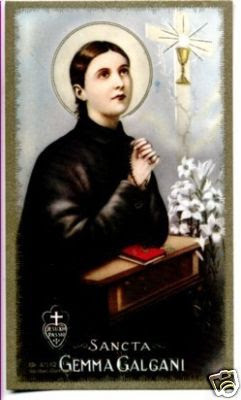 Writing to Father Germanus on another occasion Gemma states "Every morning I go to Holy Communion: The greatest and only comfort I have, although I in no way possess what is needed to worthily approach Jesus. The loving treatment that Jesus gives me every morning in Holy Communion inspires within me unutterable sweetness and draws to Himself all the weak affections of my miserable heart." the good child went into ecstasy, heart beating with joy at her Mothers feet. "How wonderful it is" she said to me afterwards, "to receive Holy Communion with my Mother of Paradise! I did so yesterday, May 8th. I had never before received Holy Communion in Her company. Do you know, Father, the outpourings of my heart at that moment? In these words "Oh Mother! My Mother!" "Jesus, sacred Host, to you I consecrate all my tenderness......Oh Jesus, Jesus my love! I am hungry for your Bread of life, I am thirsting for your sacramental Blood!" "......I am Yours Jesus. But, by so much kindness and so much love, what power would not be conquered? Whose will would not be swept away?" ".....Beloved Jesus!.....When I see good souls come, oh Lord, to enjoy the delights of your heaven in Communion, I feel compassion; but when You accept souls like me, then....O Lord, You come to me entirely as Love, and I come to You as a sinner; one so lazy. Oh Lord, let me say it---perhaps in giving me such Things You debase Them too much. Or is it that You desire a total change in my life? What shall I do to be pleasing to You? Do you want me, Oh Lord, to change your crown of thorns into a crown of lilies?" "Oh Father, today at 5 o'clock I went to Confession, and the Confessor said he will deprive me of Jesus. Oh Father, Father! My pen refuses to write, my hand is shaking and I am crying." Dear Jesus, I love you so much! I shall endeavor always to love You; I shall live to love You; I shall die to love You! ....Give me wings oh Jesus, so I can fly to Your throne!" These comments on the Blessed Sacrament are wonderful. I certainly enjoyed reading the letter St. Gemma had written to her nephew Mariano. I would like to use some of these quotations in a sermon concerning the Blessed Sacrament and the Real Presence. Thank you so much for providing such a valuable resource on St. Gemma. Thank you for your kind comments. 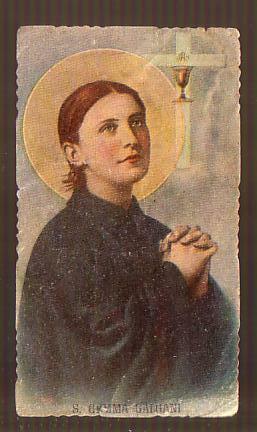 I am really glad to hear that you find some of the quotes of St Gemma to be useful and edifying. Feel free to use anything you would like from this website! It is nice to hear from you again. Please bless my family and I. Union in the Hearts of Jesus & Mary. all praise and thanksgiving be every moment Thine." Blessed Sacrament, pray for us! I love Gemma and Jesus so so much because, I am a good Christian and so on. i love Gemma because, She has touched me, in a dream and said to me, to go and pray toher, now I have since that special day the feeling that she is always arround me or by my side. I love her. So I can onlysay how good she was and still is. Tha Gemma may bless all!